Ghardaïa (Arabic: غرداية‎‎, Mzab-Berber: taƔerdayt, Taɣerdayt) is the capital city of Ghardaïa Province, Algeria. The commune of Ghardaïa has a population of 93,423 according to the 2008 census, up from 87,599 in 1998, with an annual growth rate of 0.7%. It is located in northern-central Algeria in the Sahara Desert and lies along the left bank of the Wadi Mzab. 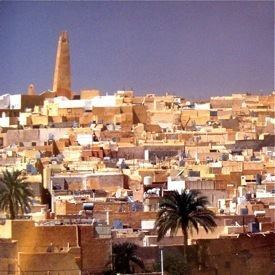 The M'zab valley in the Ghardaïa Province (Wilaya) was inscribed under the UNESCO World Heritage List in 1982, as a cultural property evaluated under the criteria II (for its settlement affecting urban planning even to the present century), III (for its Ibadi cultural values), and V (a settlement culture which has prevailed to the present century). The name of Ghardaïa has its origins in a female saint named Daïa who lived in a cave (ghār) in the area before it blossomed into a town inhabited by Ibadite Muslims who came to escape persecution from Fatimite Muslims in the north. Alternatively, Ghardaïa's name may be derived from the Tamazight word Tagherdayt (ⵟⴰⴳⵀⴻⵔⴷⴰⵢⵜ) meaning the castle. The M'Zab valley, in limestone plateau, as inscribed under the UNESCO Heritage List, is a unique conglomeration of five cities confined in area of 75 km² situated 600 km to the south of Algiers, the capital of Algeria. Original architecture of the semi desert valley is dated to early 11th century ascribed to the Ibadis with their cultural identity originally traced to the Maghreb who had their capital at Tahert as an Ibadi Kingdom. They were forced to leave Tahert consequent to a devastating fire in 909 (it is reported that destruction was caused by the founder of the (Shi'ite) Fatimid Dynasty). They first moved to Sedrata and finally to M'Zab valley. They settled in five fortified villages located on rocky outcrops, known locally as “Kosars”, even though they could have lived in one larger village encompassing all the five, which were planned with meticulous details to precise layouts defined by set principles of community living within a defensive environment. Each village was planned in diverse topography comprising a small island, a ridge, a hilltop, a peak and a recess. The villages were fortified in such a manner that they were inaccessible to the nomadic groups. The five villages set up with identical planning concepts were Ghardaïa, Melika, Beni Isguen, Bou Noura and El Atteuf. The identical “miniature citadels” as they are termed had each their own mosque with minaret functioning as watch towers, houses built around the mosque in concentric circles and surrounded by a high walls (extending up to the ramparts). which together gave the feel of a fortress to each village. The mosque also provided for storage of grains and arms for defence. However, during the summer season as they migrated to a "citadel" outside the fortified villages, in an informal setting of artificial palm grove, a cemetery and a mosque. The city is located within the Sahara Desert in northern-central Algeria. The Ghardaïa Province is divided into 13 communes or municipalities, which includes the Ghardaïa municipality. It is bordered by Ouargla and El Bayadh Wilayas. It is nestled in the M'zab valley, lying on the left bank of the Wadi Mzab, which is commonly dry throughout the year. The commune of Ghardaïa now covers an area of 590 km2 (230 sq mi) and includes a number of suburbs, towns and villages in addition to Ghardaïa. Suburb settlements include Mélika, Béni Isguen, Bounoura (Has Bunur) and El Atteuf (Tadjnint), all of which lie to the southeast of Ghardaïa city and the ancient ksar of Metlili-Chaamba or Metlili which lies 42 km (26 mi) to the southwest. Outside of the Mzab valley, Berriane (Has Ibergane) and El Guerrara (Iguerraren) are towns of note, the first 45 km (28 mi) to the north, and the second 110 km (68 mi) to the northeast. Ghardaïa's ancient water distribution system was devised by the Mozabites, keeping in view the ephemeral flows of its oueds (rivers). Realising the preciousness of this natural resource, the Mozabites developed a unique hydraulic system of underground tunnels to harvest rainwater and divert it to the oases. They have an equitable water distribution to all gardens and also maintain good flood protection measures. The water supply is accessed in a number of ways through an incredible irrigation system that distributes water from many wells. Well drilling occurs to a depth ranging from 350 ft (110 m) to 500 ft (150 m), then drawing the water from the Albian fossil groundwater continental infill whose reserves are estimated at 1.5 trillion m3. 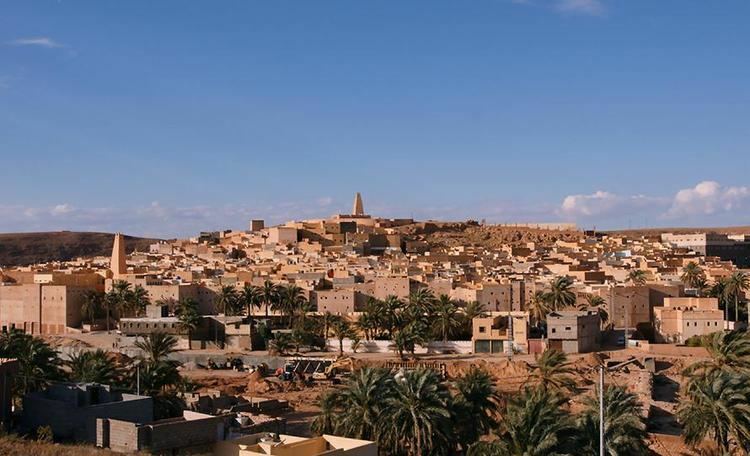 Ghardaïa has a hot desert climate (Köppen climate classification BWh), with extremely hot summers and mild winters. The region is marked by large temperature differences between day and night, and summer and winter ranging from lows of 5 °C (41 °F) to highs of 46 °C (114.8 °F). The prevailing winds of summer are extremely hot, extremely dry and strong and those of winter are warm and dry. Sandstorms generally occur from March to May. In October 2008, Ghardaïa was severely affected by flooding due to heavy rain. The unique layout of the Ghardaïa village is dictated by the rocky terrain of the region. Apart from the mosques and the housing pattern layout, with the mosque at the top of the hill, and the houses laid in labyrinthine alleyways, there is also a large market centre. The houses in particular are oriented in such a way that it admits sunlight into every as they strongly believe: "Inhabitants of the house where sun comes in will never see a doctor". Chimneys are also set in such a way that they do not encroach their neighbours comfort. 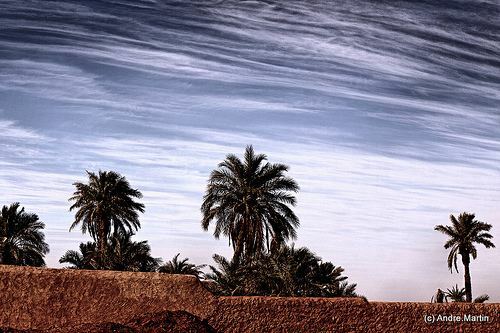 Ghardaïa is a major centre of date production, with nearly 60,000 palm trees producing dates. The wood of dead palms is used to make house roofs; live trees are not killed as they are considered living beings that sustain the inhabitants. Another important industry is the manufacture of rugs and cloths. 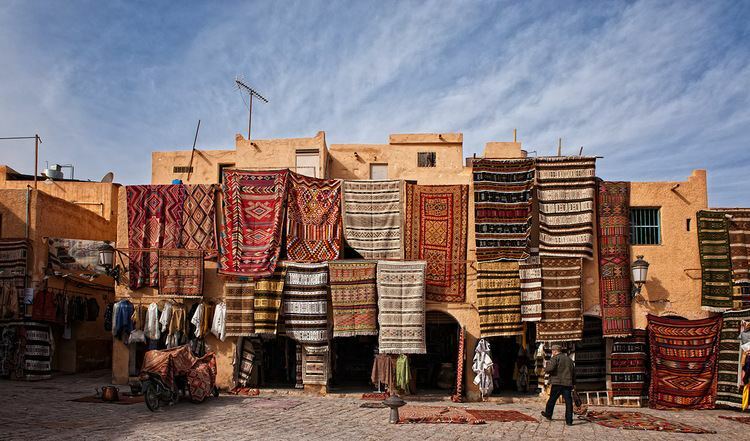 Ghardaïa is renowned for its coarse goat hair carpets, generally with simple geometric patterns in black and white. Metlili-Chaamba is known for its "Deglet Nour" dates and its camel hair products. One important aspect of the social life and economic values of the people of the region is that begging and theft are non-existent in the community. The society is close-knit, and all aspects of economy and social customs are dictated by the community. The residents have preserved the original medieval architecture remarkably well; the valley of which it forms being a part of an official World Heritage Site. The Medabian quarter lies to the northwest. The military compound and hospital are located in the southern area. It is given the epithet "the pearl of the oasis" and is as one of the most important tourist regions for its ancient cultural heritage in southern Algeria. Apart from the tourism interests, the Wilaya of Ghardaïa also draws anthropologists, architects, researchers and historians to explore its rich cultural, anthropological and architectural uniqueness. An interesting aspect of their community welfare is the fact that they follow the rules of governance diligently and also contribute to the maintenance and care of the community. Mozabites in the light of their rigid approach in negotiations, dominate the financial sector, particularly in banking and wholesale sectors They also have their own mosque, cemetery, recreation and sporting activities. They have a patriarchal system of social inheritance. Another unique feature among the Mozabites is that right from birth a “Mozabite is looked after by the community for education, work, marriage, and the building of a home. Touiza (groups of volunteers) are organised for building houses.” The Wilaya of Ghardaïa is also well known for its Weaving, Dinanderie D'art, basketry, pottery and carpet weaving (tapestry). The rugs of the area so popular that every year the "National Day Of Rugs" is held in March. The Mozabites of Ghardaïa have their distinct identity of traditional costume of saroual loubia (baggy trousers) and chéchia (head gear). Every spring, the commune of Metlili-Chaamba, 31.3 km (19.4 mi) from Ghardaïa, celebrates the "Day mehr" when people from all over the country attend and participate in a camel race. In March and April, a carpet festival provides an opportunity for celebration, competition, as well as sales. Ghardaïa is the traditional heart of the M'zab valley and home of the Ibadi religious sect in Algeria. As a religious Muslim sect they did not subscribe to the doctrine of Sunnism and Shi'ism. They practice a different way, praying, worship of God and designing mosques as compared with Malikis who form the majority of Algerians. Here, wasting water, and more generally any gift of land, is considered a sin. The Ghardaïa Mosque, built in the 10th century, is of Moorish architecture style. Its tower, simple and elegant, includes a large portal at the top of the shaft, the design of which provides for ventilation flow. The White Fathers, a Roman Catholic missionary society, live in a hermitage near the old city, and have a collection of books on the Sahara. The pro-cathedral still testifies to the time when it was the seat from 1901 successively if the Apostolic Prefecture of Ghardaïa, renamed as Apostolic Prefecture of Ghardaïa in the Sahara, in 1948 promoted to Apostolic Vicariate of Ghardaïa in the Sahara, which in 1955 was promoted to the Roman Catholic Diocese of Laghouat (where the cathedral is meanwhile secularized; still exempt). 6.5% of the population has a tertiary education, and another 18.2% has completed secondary education. The overall literacy rate is 87.4%, and is 93.2% among males and 81.5% among females. It is served by Noumérat - Moufdi Zakaria Airport (or simply Ghardaïa airport). There is also a bus station. The airport is named after famous Algerian writer Moufdi Zakaria, who was born in Ghardaïa. Mokhtar Belmokhtar, Algerian former military commander of al-Mulathameen (The Masked Brigade).